The workshop aims to open up new avenues for women in science in the field of science journalism. The programme is planned to generate a trained workforce to take on emerging roles in the growing scientific enterprise and to raise awareness about other career options in STEM. The workshop is organised by the British Council, IISER Pune and IndiaBioscience through the Newton-Bhabha Fund. 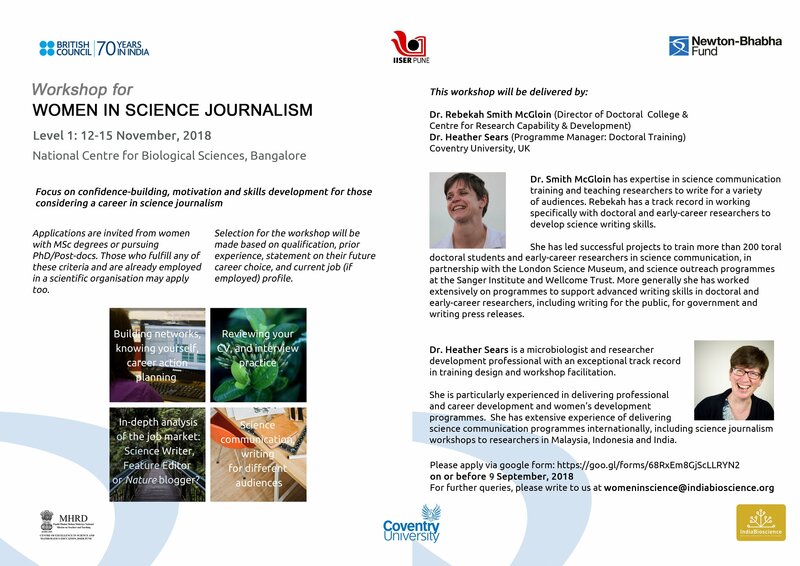 On 12 November, 2018, one day prior to the start of the workshop, there will be an Orientation Session on Careers in Science Communication/Journalism with speakers from India working in related areas. This session is free and open to everyone. Schedule can be found here (link). There are two levels to the workshop. The first level of the workshop, which is for 3 days, will include up to 50 selected participants and will involve in-depth discussions and assignments. About 20 of these participants will have the opportunity to attend a second, advanced level of the workshop scheduled on 7-8 January, 2019 at IISER, Pune. Trainers of the workshop: This workshop would be conducted by a team of experienced faculty from Coventry University, UK. Applications are invited from women with MSc degree or pursuing PhD/Post-doc in the STEM area. Those who fulfill any of these criteria and are already employed in a scientific organisation may apply too. Selection for the workshop will be made based on qualification, prior experience, statement on their future career choice, and current job (if employed) profile. All registered participants for the workshop are expected to commit four full days to attend the orientation day and the workshop.They all need to be actively involved in all discussions and assignments. There is no registration fee. Accommodation (for outstation participants) and boarding, would be provided free of cost. The registration is now closed for the workshop. The list of applicants selected for Workshop for Women in Science Journalism, level 1 can be found here. The workshop would be conducted by a team of experienced faculty from Coventry University, UK.